I got up at 6:30AM and the day started off not so good. I ran out of propane, so no early morning coffee. Bummer! I had cereal for breakfast then got organized to paint the bottom. First I masked off the waterline. 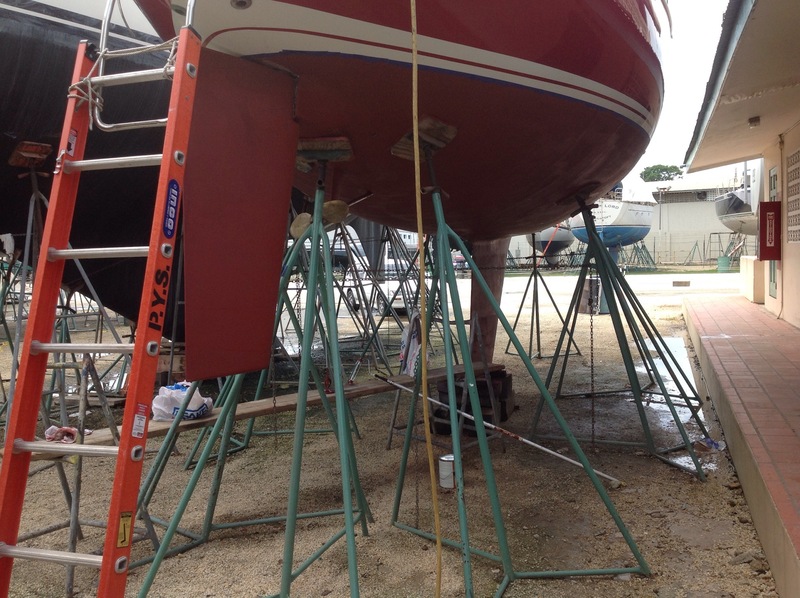 This required moving a short stand around the boat so I could reach high enough to put the masking tape on. 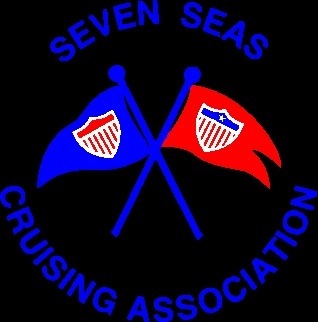 The yard has Changes 12+ inches higher than the Sailing Center back in Ohio. Next I had to walk to Budget Marine to get a 7 in roller frame, roller cover and steel roller pan. Those plastic roller pans melt if you try to use one with bottom paint. Rain was in the forecast so I looked at the clouds and paused hoping for a break. Soon the sun came out so I forged ahead. I got all my stuff on the ground and opened up the paint and used my drill to mix the paint. I spent the next two hours rolling on paint. I was almost in trouble as a few drops of rain came down and for a while it got windy as if a big rain was coming. But it all blew through. After I was hot so I went on Changes and sat in front of a fan in my underwear. I almost dozed off when I heard something close by. I put on shorts and a t shirt and went out to investigate. The yard was putting my neighbor, a 75+ foot sailboat in the water. This was entertainment for the next hour. After it was in the water they med moored it to Peakes dock. This requires three inflatable dinghies and some guys on the dock. It was very interesting as I never watched this before. With no propane I’ll have to go out to eat. So that’s all for now. Here are photos of the completed paint job on the bottom. 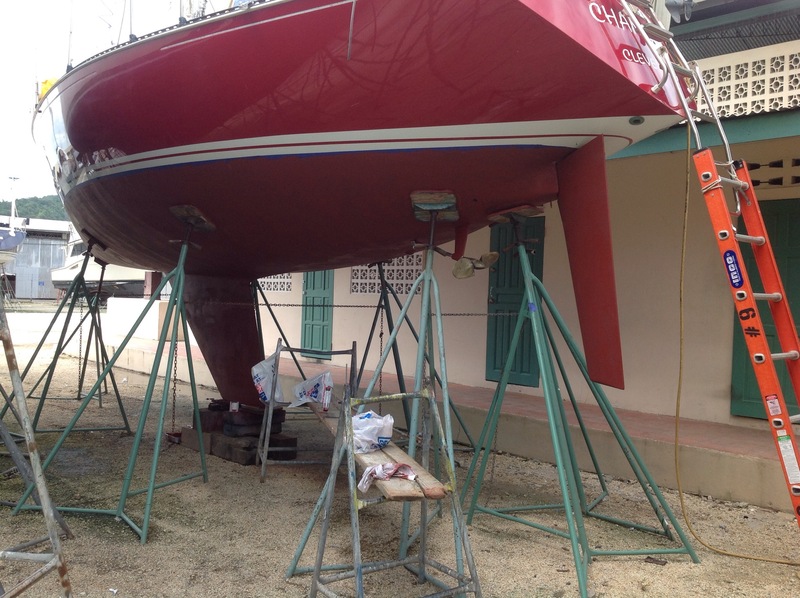 This entry was posted in 2013, 2014, Caribbean, SV Changes, Trinidad, Working on the Bottom and tagged 65 ft boat, bottom paint, hot. Bookmark the permalink. Ahh. The simple pleasures of life. 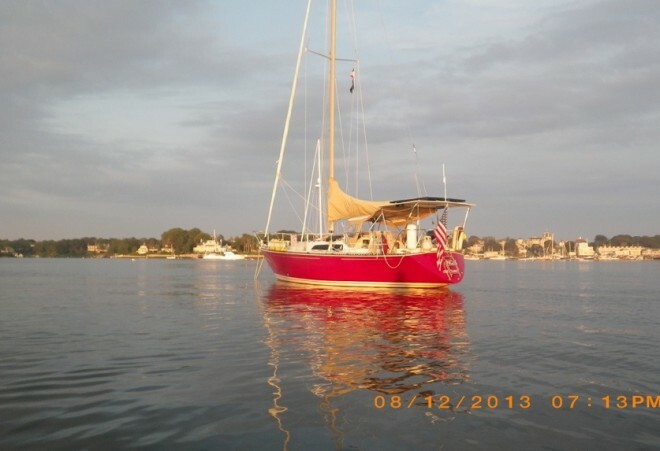 It’s always better when another sailboat owner (or the help) is experiencing nervousness. Love reding about your progress. Take care. You are right John. Phil will need to explain that for the non sailors.